Join us for our sparkling holiday celebration of the season featuring Domaine Carneros Sparkling Wine at Salum on December 10 at 7 pm. When the Champagne house, Taittinger, looked to create their ultra-premium winery in California they knew the rolling hills of Carneros was ideal to help create their lively, layered, special sparklers. They also knew they needed a dynamic, passionate leader, bringing in the Doyenne of Sparkling Wine in California, the incredible Eileen Crane. We're planning ahead at Dallas Uncorked in anticipation for what we know will be one of the most incredible dinners we have done. June 5 we will celebrate our 13th anniversary at Suze Restaurant with rising Napa Valley star, Winemaker Julien Fayard. In addition to his own winery in Coombsville, Covert, a small production operation created with his wife, Elan, along with two other wine loving families, Cal and Pam Nicholson, owners of Nicholson Jones Winery, and Dave and Laura Nestor, Julien is the winemaker or consulting winemaker for a dozen others, including Purlieu, Sire, Azur, and Caspar. The evening will feature a selection of Julien's wines from throughout Napa, paired perfectly with Suze Chef/Owner, Gilbert Garza's, seasonally focused cuisine. Julien will join us for this special night, sharing his story and adventures in wine in both his native France and California. Julien will join us for this special night, sharing his story and adventures in wine in both his native France, and California. Proceeds from the evening will benefit The Stewpot and Charity:Water. Tickets available here, but they are limited. Advance ticket pricing through May 14 is $110, after May 14 tickets will be $125 each, so get yours early and join us for this wonderful celebration! Join me and Gary on February 22 at Studio Movie Grill/Royal Lane, Dallas location for an evening of wine and film, toasting the 2017 Oscars, benefiting The Dallas Film Society, tickets available here. Gary will walk through the top nominations for this year's 89th Annual Academy Awards. Sommelier Hayley Hamilton Cogill will join the discussion, pairing a selection of wines with key award contenders and categories. Light appetizers and movie favorites from Studio Movie Grill's menu will be included with the selections. The evening will feature a select number of incredible live auction items, including the same wines every celebrity will be drinking at this year's "Oscars," and All-Access Star Passes for the 2017 Dallas International Film Festival, with proceeds benefiting the Dallas Film Society. Every attendee will receive a ticket to Studio Movie Grill to see a nominated film or new release on a future date. Tickets for this special night, including the discussion, wine, snacks and an additional movie ticket for a later date are only $40, available through the Studio Movie Grill website, here. Film Critic, Gary Cogill, breaks down the list of the top films of the year just in time for Oscar season. He'll delve into each of the top award categories for the year, noting the hits and the misses, and who is sure to win. In perfect pairing form, Sommelier and Founder of Dallas Uncorked, Hayley Hamilton Cogill, will pair the ideal wine for each, making this tasting one to remember. The event will take place at The Dallas Arboretum on January 26, with proceeds benefiting this beautiful garden sanctuary in the heart of Dallas. Five wines will be paired for the discussion, along with a light appetizer. We are thrilled to be a part of a special night of wine, food, and friendship, for good. Details and tickets on their site here. Join Dallas Uncorked November 13 as we welcome David Beckstoffer, President & CEO of the highly acclaimed Beckstoffer Vineyards in Napa Valley & owner of KATA Wines, for a special pairing dinner featuring his beautiful KATA wines from Beckstoffer Bourn Vineyard in St. Helena. David and his father, Andy Beckstoffer, have grown some of the most prized Cabernet Sauvignon in Napa Valley from heritage vineyards, some dating back to the mid-1800's, for over 40 years. In 2010 David took the leap of starting his own winery, bringing in one of the best to help him, Winemaker Benoit Touquette. In addition to his partnership with David, Benoit is the Winemaker for Realm, Jack Quin & Hartwell in Napa Valley, and owner of Fait Main & Teeter Totter.The duo are easily considered bright stars in the region, and country. Once again for this event, honoring the year's vintage and seasonal bounty, we'll partner with our friend, Chef Abraham Salum at his Salum Restaurant for a perfectly paired feast to match the robust, bold flavors of the current release KATA Wine, as well as an older vintage or two. The evening will benefit two charities we love, The Stewpot, helping the homeless and at risk of Dallas for over 40 years, and the "We Over Me" Farm at Paul Quinn College. The Stewpot is always one of our recipients of this dinner, as their selfless work transforms the lives of so many in need. The"We Over Me" Farm at Paul Quinn College is a new recipient for us, and one we are thrilled to be able to assist. Started in 2010, the “We Over Me” Farm began to transform the health and well-being of under-resourced communities in southern Dallas by providing fresh, healthy, affordable food options and by educating and empowering future generations to take better care of themselves, their environments, and their communities. Located in a federally-recognized food desert, the Farm has produced and provided more than 30,000 pounds of organic produce since its inception in March 2010, of which much is donated to neighborhood organizations. In addition to providing fresh, healthy, affordable food options, the Farm strives to improve communities throughout the metroplex by providing hands-on educational experiences for youth and adults alike to promote healthy eating. Tickets are $115, available in advance only via our ticketing link here. We look forward to welcoming David and seeing everyone in celebration of this year's harvest! Join me, Gary Cogill and the Dallas Chapter of Les Dames d'Escoffier International for an exclusive two-part film event with Studio Movie Grill Royal Lane. Join the Dallas Chapter of Les Dames d'Escoffier and Studio Movie Grill for an exclusive, two-part movie series on Monday, September 12 and Monday, September 19 at 6pm at Studio Movie Grill, Royal Lane in Dallas. The two-night series with kick off on Monday, Sept. 12 with the film "BIg Night" starring Stanley Tucchi, Tony Shalhoub & Issabella Rosselini. Tucchi & Shaloub play immigrant brothers from Italy who open their dream Italian restaurant in 1950's-era New Jersey. All does not go well and the duo have one Big Night to try to save their failing restaurant in a comical, endearing and simply delicious Italian celebration. Our second evening, Sept. 19, will feature the film "Chocolat" starring Johnny Depp, Judi Dench and the simply enchanting Juliet Binoche. When a single mother and young daughter move to rural France and open a chocolate shop they are met with some skepticism. But they are warmly welcomed when the townspeople taste their divine chocolate. Each evening will begin with a reception welcoming guests to the event featuring some of your Dallas Dames, including Celebrity Chef Tiffany Derry, Chef/Owner of Parigi, Janice Provost, Chef/Owner of Stocks & Bondy, Joanne Bondy, Pastry Chef Jill Bates with The Ritz-Carlton, Dallas, Sommelier/Co-Owner of The Grape, Courtney Luscher, Sommelier & reVolver Podcast Host, Hayley Hamilton Cogill, and more. Select Dames will then join KXAS-TV Film Critic and Producer, Gary Cogill, for a panel discussion before the film on what movies may have impacted them as they became chefs, and why. Studio Movie Grill has created a special Dames "Film, Femmes & Foodies" focused menu, featuring specialty cocktails, special wines and delicious food choices to pair with each film. Our reception begins at 6pm, with the films starting each night around 7:30. Tickets are $20 for one night; additionally we have a limited number of tickets to purchase both nights for $30. Ticket price covers the film admission and the Chef's discussion; food & drinks are not included in the ticket price. Proceeds from the event will benefit the LDEI-Dallas scholarship fund, helping to educate women in the hospitality fields in Dallas. LDEI-Dallas is a 501c3 not for profit organization. Dallas Uncorked invites you to celebrate our 12th Anniversary with us on Sunday, June 12, 2016 at 6:30pm at one of our favorite places in town, Sevy's Grill, when we welcome a new winery to the Texas market. Ram's Gate Winery, an ultra-premium winery at the entrance to Sonoma County specializes in crafting small lot Pinot Noir and Chardonnay wines from some of the best vintners in the region including Hyde, El Diablo, Hudson and more, including their own Carneros Estate. I first tried these wines last year and immediately knew we needed to help introduce them into the Dallas market through one of our events. I couldn't be more thrilled to do so for our anniversary event. Luke Stanko, Assistant Winemaker for Ram's Gate, along with Ram's Gate General Manager, David Oliver, will be joining us to discuss the wine and the care, dedication and passion that goes into each and every glass. Through a multi-course tasting menu we will taste through a selection of their new releases, tasting wines side by side from a variety of different Sonoma vineyards to understand the differences and nuances of each vineyard throughout the region. Our hope is that you will come away with an appreciation of the wines, and a deeper understanding of why Sonoma is such an ideal place for growing cool weather Pinot Noir and Chardonnay. Our fantastic friend, Chef Jim Severson of Sevy's, will artfully pair each variety to help enhance these nuances. Proceeds from this year's dinner event will benefit The Birthday Party Project. We celebrated the work of founder Paige Chenault and her team a few years ago for our 10th birthday celebration, and we continue to be inspired by her and the generous giving The Birthday Party Project does every month, delivering joy to thousands of children through the celebration of birthdays. Twelve years ago we had an idea to start an educational wine organization that would teach our members and guests about wine in a fun, unpretentious, unique way. We are so proud of what Dallas Uncorked is, and how it has grown over the past 12 years, with each event giving back to charitable organizations throughout the city, country and internationally, doing good through the beauty of wine. We thank all of our incredible members, friends and guests for helping us grow Dallas Uncorked into what we have today. Tickets available here for $100 each. We look forward to celebrating with you in June! 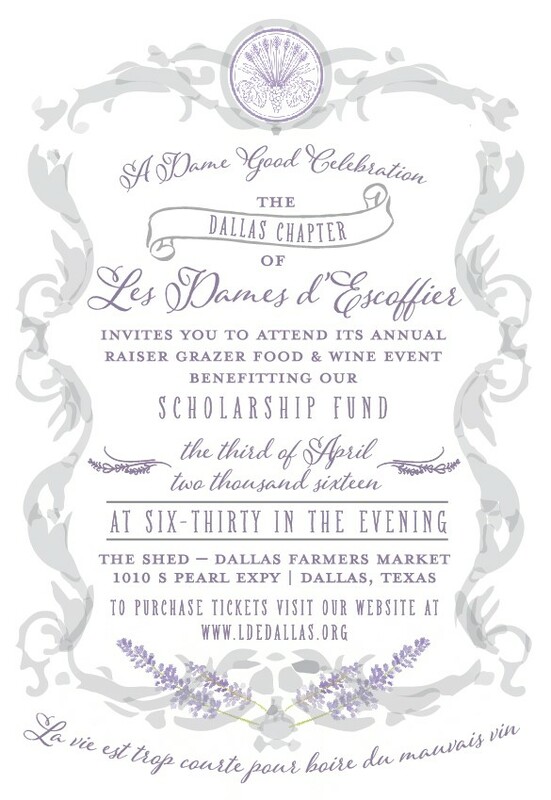 Join us April 3, 2016 at 6pm for a "Dame Good Celebration" for the Dallas Chapter of Les Dames d'Escoffier International as we raise funds for scholarships to send women to school for advancing their careers in the fields of food, fine beverage and hospitality. Tickets available here. A glass of wine and a great movie go hand in hand, we think it is the perfect pairing. And now is the best time of year to enjoy both as theaters are filled with Academy Award contenders, and wineries all over the world have their new releases on the shelves ready for enjoyment. Gary will lead guests on an interactive discussion of what to see, what not to, and mainly, what is sure to win this year's "Oscar" for all of your favorite film catergories. Gary will also share some of his favorite stories of being on the set working with actors like Clive Owen and Morgan Freeman, and of course favorite stories of the 30+ years of being in the business and interviewing almost every actor in the world. Each ticket will include two glasses of wine, a sparkling wine toast and light appetizers. Additional wine will be available all night at special happy hour prices. We will also have a limited and exclusvie live auction of film focused items to help our donation make that much more of an impact. Tickets are $40 each and available here. This event sold out fast last year so don't delay in getting your tickets early. We look forward to seeing you there. Please join Dallas Uncorked on November 9 as we host Rene Schlatter, Owner of the highly acclaimed Merryvale Winery in Napa Valley, for a very special wine dinner at Hibiscus Restaurant, benefiting the Dallas Chapter of Les Dames d'Escoffier International. Starting the evening with a glass of Merryvale's special, small production, traditional method sparkling wine, Solstice, Rene will lead guests through a tasting of some of his most prized wines, each expertly paired with the seasonally inspired, farm to table cuisine of Hibiscus, known for their elevated the flavors which celebrate the season, while focusing on produce and proteins from throughout the region. Rene's father, Jack Schlater, joined what is now Merryvale in 1991, at the time, working under the name Sunny St. Helena Winery with Bill Harlan and partners at the helm. In 1991 the winery was renamed Merryvale, with the Schlater family taking full ownership in 1996. Since the beginning of their involvement with the winery in the 1990's to today Merryvale has become one of the highest regarded properties in Napa. Known for their high quality, elegant, expressive wines with the true character of the variety shining through each and every beautiful bottle. Over the multi course meal we will taste Merryvale's cool climate, Carneros estate Chardonnay, their expressive, refined Merryvale Cabernet Sauvignon, their floral, fresh Cabernet Franc (my favorite from the winery,) and a special pour of their flagship Bordeaux style blend, Profile. The evening will benefit the Dallas Chapter of Les Dames d'Escoffier International. I am a Dame, invited to join the invitation only, women's organization not long ago, and am so proud to be a part of an incredible group of women, helping other women, in the hospitality industry. We are a worldwide philanthropic society of professional women leaders in the fields of food, fine beverage and hospitality, with a membership of some of the finest women in the industry, from our first Grand Dame, Julia Child, to Alice Waters, Alexandra Guarnaschelli, Carla Hall, Mary Sue Miliken and hundreds more, including Dallas Dames Tiffany Derry, Courtney Luscher, Joannne Bondy and Janice Provost. Tickets are $170 each, available here. It is that time of year, and if you are looking for a unique and spirited was to show how much you care, consider throwing a holiday wine tasting. With over 15 years of wine education experience Dallas Uncorked founder, Hayley Hamilton Cogill, is your perfect guide for a fun, festive wine tasting and toasting experience. Each event is unique and customization to your specific requests to fit any budget. Contact us for more details, info@dallasuncorked.org. Let us know how we can help. Please join Dallas Uncorked on October 11 as we partner with Pail Wines and Salum Restaurant for our annual Harvest Dinner, this year benefiting New Friends New Life. We are honored to celebrate the fall season with the exquisite wines from Pali Winery, featuring a selection of their single vineyard, premium Pinot Noir wines from some of the finest vineyard sites in Northern California. Each selection will be paired with the imaginative, seasonal and always delicious creations of our friend Chef Abraham Salum at his Salum Restaurant in the heart of Dallas. We are equally as honored to donate the proceeds from this year's event to a charity we truly admire and appreciate, New Friends New Life. Started in 1998, "New Friends New Life restores and empowers formerly trafficked girls and sexually exploited women and their children. By providing access to education, job training, interim financial assistance, mental health and spiritual support, New Friends New Life helps women and their children overcome backgrounds of abuse, addiction, poverty and limited opportunities." I wish this reality wasn't true, but Dallas ranks amongst one of the highest percentages of trafficked girls and women. To be able to help New Friends New Life in supporting their incredible work is crucial in changing these statistics in our city. A small portion of the evenings proceeds will also benefit The Stewpot. Each year this annual event gives a donation to The Stewpot as their work with the homeless of Dallas is crucial in helping change the lives of those so much in need. Though working with The Bridge to provide meals, as well as education, job assistance, healthcare, etc. The Stewpot is a treasure to our city and one we are always so proud to support. My dear friend, Ginger Dollins of Pali Wines, and a great supporter of the kind of work NFNL does, will be on hand at the dinner to discuss each of her luxurious wines. Katie Pedigo with New Friends New Life will also be joining us.